When I was shopping at the farmers market on Saturday there were a lot of people running around with pink clothing and wigs. Being a bit clueless, I finally realized that there must have been an event to raise awareness and money for breast cancer research. Have you heard the term pinkwashing? It is an ad and marketing campaign where a company or organization claims to care about breast cancer by promoting a pink ribbon product, but at the same time produces, manufactures and/or sells products that are linked to the disease. One way to deal with pinkwashing is to learn more about the product you buy. 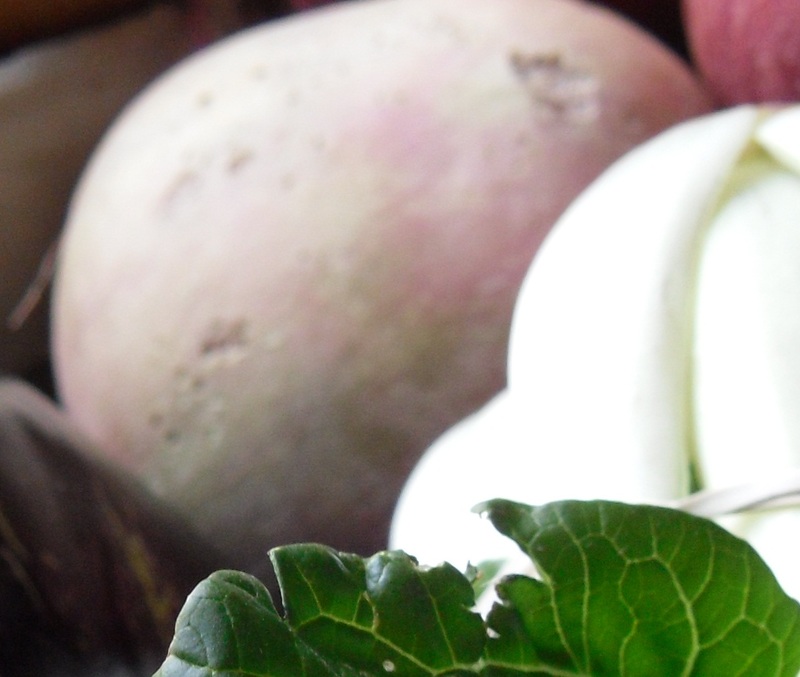 Digging a bit deeper, one learns that radishes are full of phytochemicals like zeaxanthin, lutein and beta-carotene. 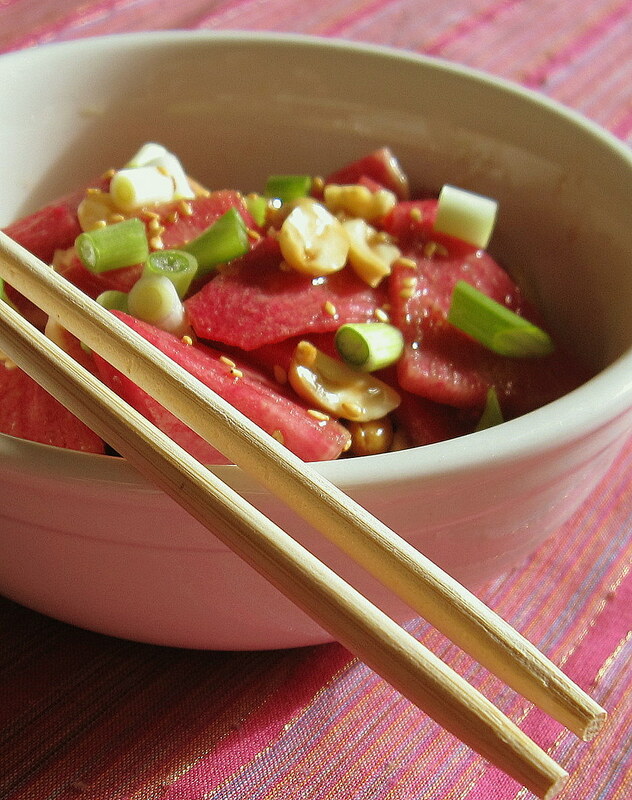 The lovely pink watermelon radish is a rich source of antioxidants, vitamins and minerals. There seems to be a pattern unfolding on this real food journey: nutrient-rich, plant based foods can have a large positive impact on our health. If you agree, join me in developing a FarmerChef lifestyle by shopping and cooking mostly local and real foods. You might even consider planting a raised-bed garden. It may seem overwhelming at first, but we can make it fun and make a difference to our health. Francine introduced me to this pink beauty when she returned from China. I picked one up at the Downtown Des Moines Farmers’ Market and decided to make this recipe. A slight variation to Francine’s recipe which is also very good. The three spices: cinnamon, turmeric, and cloves are added because of their health benefits and flavor. 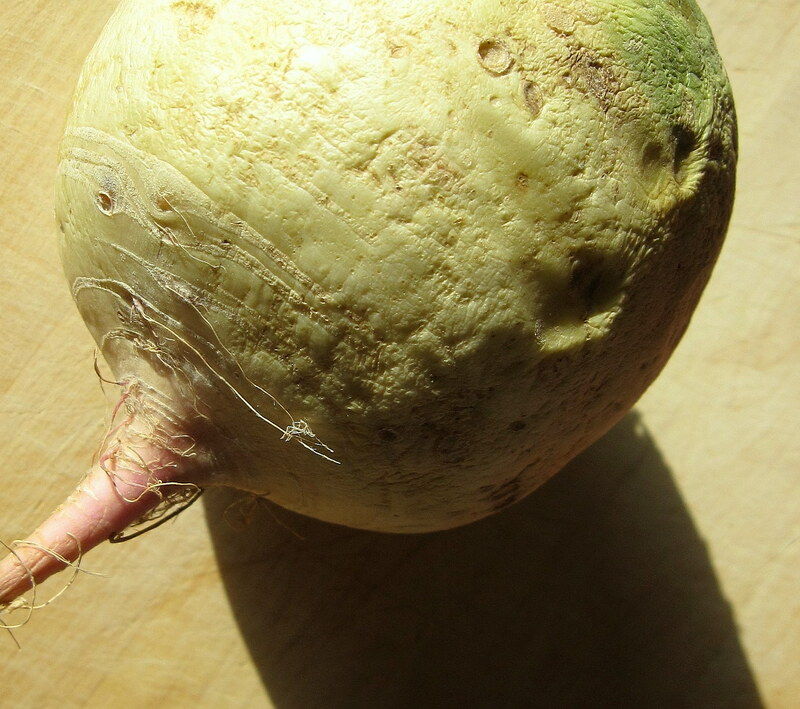 Use a peeler to remove the outside of the radish. 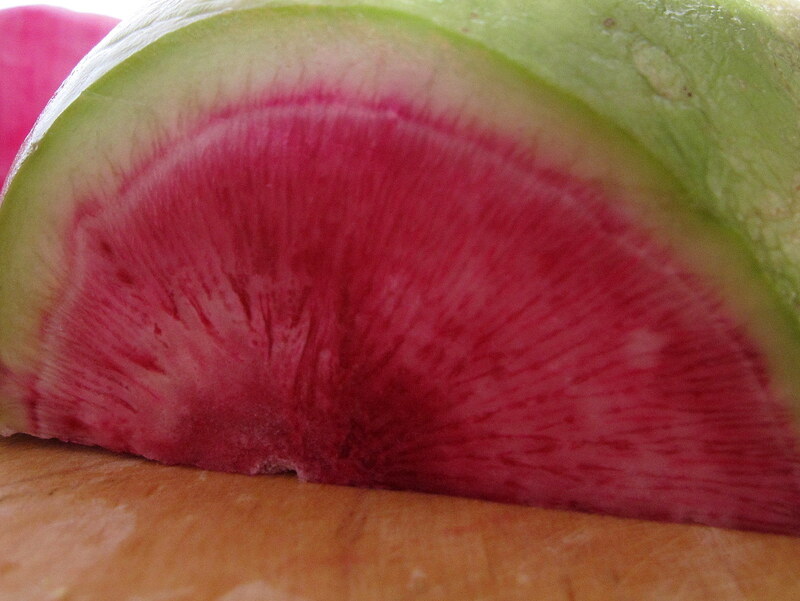 Slice radish and then cut slices into lovely pink ribbons. Slice onion and place in large mixing bowl. 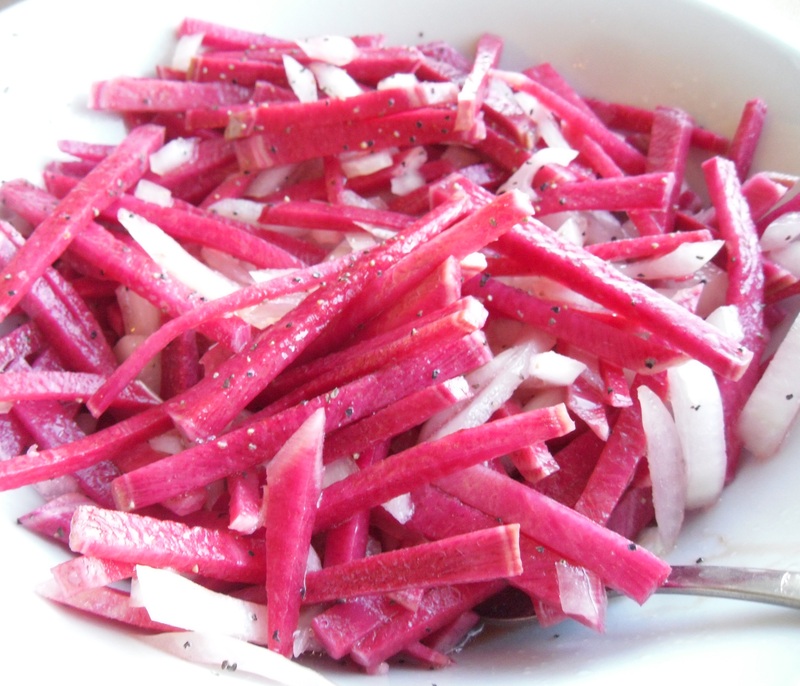 In a smaller bowl mix the juice, oil, sea salt, pepper, rice wine vinegar, cinnamon, cloves, and turmeric and make a simple dressing to pour over the radish and onions. Do you think it would be cool to pass out these radishes at the next #bepink event? 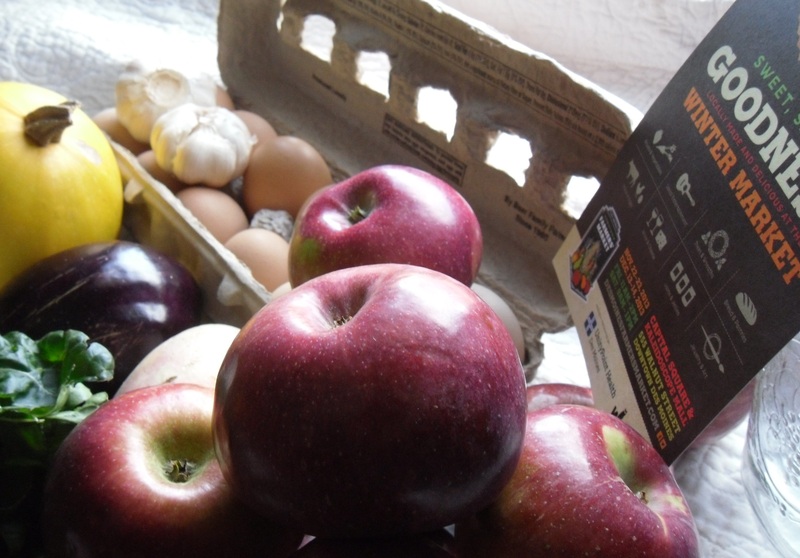 Imagine the conversations and education about the value of real food. 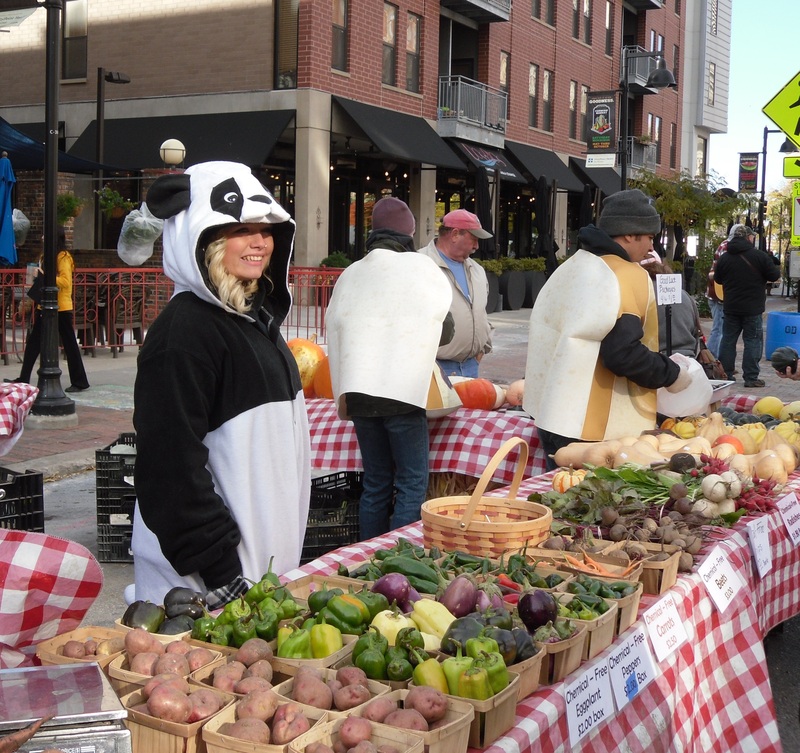 Before I left Southwest Minnesota, many people told me about the weekly celebration of local food that occurs in downtown Des Moines every Saturday morning from May until October. I have been able to visit the market three times since we have arrived in September. 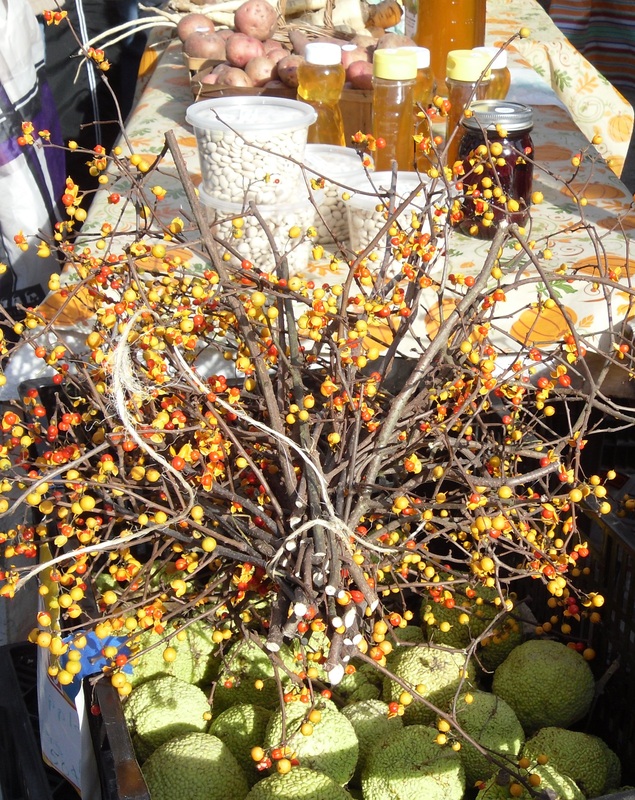 This last Saturday was the final day for the market this year. It was a brisk, yet bright and breezy day to take in the sounds (local entertainment), sights (bountiful displays of vegetables and fruit), and the tempting aromas (lots of food vendors). I got a little distracted by the beautiful fall colors at the honey table but then I snapped into focus and started filling my bag with eggs, eggplant, apples, garlic, spaghetti squash, bok choy, and watermelon radish. I so admire the spirit of the farmers who work hard all week and diligently arrive (from long distances) early in the morning to set up their booths. More than a few farmers wore costumes and held down their canopies as the breeze turned into winter-y gusts that ripped through the canyon of city blocks. I had a chuckle from this article that was re-tweeted on Saturday. It explains the five types of people you might see at the market. Check it out…which one are you?